During the Modesto Irrigation District Board Meeting on July 24,2012, Board President Tom Van Groningen refused to allow the public to speak in response to several agendized items. This is a direct violation and should not be allowed but this Board President likes making up rules as he goes along. Just a point of reference, but Bee reporter John Holland was sitting just a few rows away from me, but somehow neglected to report this Brown Act Violation in his story about the meeting. The Public Records Act limits the time a public agency has to respond to inquiries and since no emergency delay has been requested, by the time MID responds they will be in violation. MID has delayed many Public Records Act requests, and this is just another example. copies of any pay outs to him or his firm. 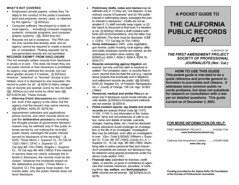 production under the California Public Records Act, or other applicable law. Do you know where your water comes from? If you’re reading this, chances are most of it originates in the “wild and scenic” Tuolumne River in Yosemite National Park. That’s where the Hetch Hetchy Reservoir stores snowmelt from the High Sierra for use throughout much of the Bay Area. San Mateo County receives about 85 percent of its water from the Tuolumne. Paying $1.5 million per year for water we no longer need makes no sense and would further outrage ratepayers. Fortunately, there’s still time for our elected representatives to choose a different path. Do you know where your city councilmembers stand on this issue? Are they even aware it’s being considered? Tonight we’ll be discussing the Bee’s inability and John Holland’s unwillingness to convey what is happening at local meetings, Our County Supervisors view on the Water sales, what’s happening in New Hampshire regarding freedom of Speech and local authorities trying to stifle it, and last but not least how Women’s Issues are playing out on the national stage. It’s starts Wednesday night at 7:00PM Pacific time. You can always catch any of the shows in the archives. And of course a big Thank You to Brad over at 104.9 FM K-GIG who broadcasts Central Valley Hornet Shows. As you all know by now, Michele Bachmann has requested an investigation into Huma Abedin, Secretary of State Hillary Clinton’s Deputy Chief of Staff. Because Ms. Abedin is a practicing Muslim, Ms. Bachmann seems to believe she is trying to destroy America from within. Ms. Bachmann suggests that Huma’s late father, her mother and her brother are connected to Muslim Brotherhood operatives and/or organizations. Ms. Abedin was born in Kalamazoo, Michigan. As a toddler her parents took her to Saudi Arabia to live. Her father and her mother both received a Ph.D. from the University of Pennsylvania, and Huma graduated from George Washington University. Her father founded an institute to promote religious understanding between East and West. This isn’t the first time Michele Bachmann has attacked a female politician. Every first lady supports a “cause”. Michelle Obama’s cause is childhood obesity. She has promoted healthy eating and exercise. She has campaigned to get more mothers to breast-feed their infants, since studies show that children who are breast-fed for the first four to six months have less chance of becoming obese than those who were fed formula. She has also tried to break down barriers to nursing in the workplace. Michele Bachmann (who, by the way breast-fed all five of her children), said “to think that government has to go out and buy my breast pump for my babies? You want to talk about the nanny state, I think you just got a new definition.” She also suggested that Michelle Obama may one day run for office and her breast-feeding and healthy eating campaign was just a preview of the nanny state that she would try to push through if elected. I’m not sure why Ms. Bachmann believes that promoting healthy eating, exercise and breast-feeding equates to a nanny state. Is there a government employee in your home watching what you eat? Monitoring how often you exercise? Making sure you breast-feed your baby? Laura Bush chose the cause of literacy while she was first lady. She went to schools and read to children. She encouraged parents to read to their children on a daily basis. Was that a “nanny state”? A more literate and healthier population can only be good for all of us. Ms. Bachmann once said that Nancy Pelosi was “sticking the taxpayer” with her $100,000 bar tab for alcohol on the military jets that she had been flying on. Politifact took a close look at this and rated Bachmann’s interpretation of Pelosi’s expenses as “pants on fire”. We all know what that means – liar, liar, liar! So to answer my question at the beginning , is Michele Bachmann a dangerous American? I believe she is. She would have us believe that anyone of a different religion or different culture is anti-American and a threat to us all. She forgets that we are all descendants of immigrants. She forgets that America is the great melting pot and it’s our diversity that makes us so unique. It’s people like Michele Bachmann who are out to destroy America. Where is Assistant City Attorney Rollie Stevens? While it doesn’t have the same connotations as asking “Who’s John Galt?” , “Where is Rollie Stevens?” should make people stop and think. Rollie Stevens was Modesto’s Attorney negotiating the water contract between the City of Modesto and the Modesto Irrigation District back in 2005. This contract spells out the fact that Modesto and the Farmers stand first in line for OUR/MID water. MID has demanded and Mayor Marsh has acquiesced to, Rollie Stevens absence at any talks between MID and Modesto. Why? Because MID knows Mr. Stevens is the most knowledgable individual on the city staff regarding this contract which is vital to Modesto’s long-term BEST interests. MID is supposed to be owned by the ratepayers but over the years, we ignored the MID Board and allowed the Board to spend/waste Millions of dollars unchecked, and at an ever-increasing rate. In recent years the public exposed several of their ill-fated ventures. One was the TANC project that the MID General Manager led, and despite public outcry against it, the proposal was curtailed only when (SMUD), Sacramento Municipal Utilities District came to their senses and pulled out of the monstrosity of overspending that General Manager Short had helped to create. The cost to MID was approximately $5 million dollars. The second was the Bio-Mass/ Garbage burner Project of Stephen Endsley. After discovering how badly they were being duped by Endsley and MID, the MID ratepayers rebelled and finally MID pulled out of the garbage burner business. The cost to ratepayers was $1.2 Million plus MID Attorney Tim O’Laughlin pocketed a cool $92,000.00 for this project alone. This was despite being assured by attorney O’Laughlin that MID had no exposure to litigation. It seems it’s all a mater of perspective with O’Laughlin, who lives in Chico, and doesn’t buy water or electricity from MID. Now MID is pretending the small sale of 2,240 acre feet isn’t important, but as always the devil is in the details. And the details here which bear importance are; if the contract is signed, the San Francisco Public Utilities Commission will be first in line for any MID water for the next fifty years, yes before Modesto and the Farmers, and has first right of refusal over any potential water sales MID might care to make. The contract also sets a price for future water sales which includes an extremely small price escalator. Just as important and maybe even more so because of its size is the looming 25,000 acre foot sale. MID intends on pursuing it immediately after the 2,240 sale, so both sales should be considered at the same time by ratepayers trying to make a decision. We also need to consider the small sale doesn’t pay for anything. The 2,240 acre feet times the $700.00 per acre foot comes to $1,568,000. yearly. At this rate it will take 70.79 tears to pay for the $110 Million in infrastructure the MID Board claims we need. And yes, the much larger sale triggers an EIR or Environmental Impact Report but with the SFPUC footing the cost and being the lead agency, stopping it at that point is a much harder task than most realize. Now back to the initial question of “Where is Rollie Stevens.” To use a sports metaphor, it’s like playing a Superbowl and having our coach decide to bench our all-pro quarterback or 2,000 yard running back because the other team doesn’t want to play against him. Why would we concede to those conditions? This is the $64,000 question we need to ask Mayor Marsh. So Mayor, why are you keeping Rollie Stevens on the sidelines? Modesto and the farmers need to stand shoulder to shoulder on the water sale issue. Agriculture is the economic driving force in the Central Valley and we need to nurture it. And as we all know, if you want to keep something alive in the Central Valley, you need to water it. We have NO extra water for sale to San Francisco. Rollie Stevens, we need you. You’ve heard about them and here they are the written exchanges between Modesto and MID. This contract is issued to provide professional services to Refocus and Enhance Public Education and Information per Board Resolution No. 2010-35. Not-to-exceed $450,000.00 plus cost and expenses. $450,000.00 for Lobbying? Now you know why your rates are so high. They been giving contracts like these to friends to stay in power. If we did not understand how out of control MID management is, this should be the final teachable moment. Remember, that $100,000 a year meter reader gets another $40,000 in benefits, partly because he pays NOTHING into his pension. Short’s pay will likely be increased by a lame Board of Directors, meaning a monthly increase of about $10,000. This pay raise will also be used to justify the next electricity rate increase. If there was ever evidence that Short must go, this is it. Also, Glen Wild and Tom VanGronigan will be up for re-election next year. Remember this when you vote. Tonight at 6:00 PM Pacific I will be guest hosting Athens Abell’s cable TV program “On Watch” with guests John Duarte and Troy McComak. It can be found on the Assyrian Channel KBSV-15 on comcast, KBES 89.5 FM, and http://www.betnahrain.org/KBSV/kbsv.htm streaming video. Just click on DSL at the top of the page. First off we’ll be discussing with John Duarte MID’s proposed water sale and the propaganda and misinformation that the Modesto Bee and others have been spreading. The we’ll bring you some interesting thoughts of Troy McComak a former California 10th District Congressional candidate. I hope you can take the time to visit with us.